Among the backstreet gangs, Tomoyo Sakagami is a legendary warrior of justice who has dished out much pain to punks and rebels. Tall as she is, no ordinary girl can calmly look at a motorbike rampaging towards her and kick the driver off. Youhei Sunohara, the sidekick of male lead Tomoya Okazaki and of the "Horny Friend" archetype, picks a fight with her on numerous occasions ("there's no way a girl can really be that strong, right?") and it always ends up with a long chain of impressive air-combo kicks to various points of his body, head, and face. Tomoyo just sighs and puts him in his place each time with a general "no, I don't have time for this" bored look. Not that she is an emotionless character - after sending him flying she blushes when Sunohara tries to make her feel indecent, or insinuates that she is actually a guy. Indeed, she often receives gifts from girls and has to hide her face (by dressing up in a teddy bear suit) when patrolling during school events because there always will be guys who want to pick a fight with her. Incidentally she's a second year student, but she doesn't care much for Senpai-Kouhai relations and will treat people as fellow students. Despite her impressive physical capabilities, Tomoyo doesn't join any club. Rather, Tomoyo wants to become the student council president for her own personal reasons. Tomoya helps campaign for her, putting in much effort to help her improve her reputation. The endeavour does not go without paying it back, and Tomoyo is surprisingly good at cooking too. When she wants to ask or do something for Tomoya, she doesn't hesitate, her courage tempered from the countless street fights she has had. 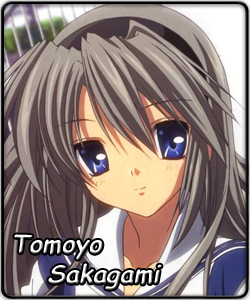 Tomoyo, like her friends Nagisa, Kyou, and Kotomi among others, is a newcomer to the Saimoé circuit. Despite this, she was able to go through the preliminaries no sweat, and quietly qualified in 7th place without dominance nor drama. Although overshadowed by Kyou and Kotomi at the moment, Tomoyo should be able to take her own courage and be able to take on the likes of past competitors who know their way around Saimoe out. Her poise and determination may one day lead her to a Saimoé tiara in the near future, but if all things play out, the first International Saimoe League tiara could fall into her hands.